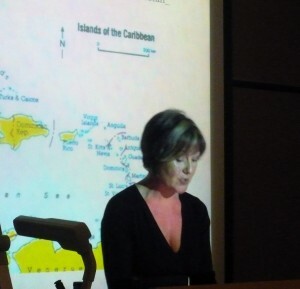 On Monday 12 March, Professor Alison Donnell addressed a diverse public audience at the Museum of English Rural Life on the subject of the Caribbean Pastoral. Drawing on the work of Caribbean poets Derek Walcott and Olive Senior, she discussed how the very idea of harmony between man and nature was fraught with tension given the region’s history of human and agricultural exploitation and yet how the astounding natural beauty of the islands has inspired wonderful works that seek to tell and to construct an alternative natural history. Nature in the Caribbean was literally reconfigured by the establishment of plantations under colonialism. The violent histories of slavery and indentureship, as well as the forced migration of plants (including the transplanted sugarcane, coffee, mango, breadfruit & coconut), meant that the relationship of people to place in the Caribbean is especially precarious. On top of the historical burden of a deeply divided relationship to land (with nature being enjoyed by white bodies in the botanic gardens and great houses while being suffered by black labouring bodies working cash crops), there was the additional pressure of a ‘natural’ world imported to the region in books – the daffodils and snow of a British colonial education. And yet, from this fraught history and the entangled languages of book and island, Caribbean writers have forged a new poetics of the environment that imagines a sense of belonging and an ecology of mutuality. This entry was posted in Department of English Literature news and events and tagged Department of English, Museum of English Rural Life, Professor Alison Donnell, Reading, University of Reading. Bookmark the permalink.